Imagine if the attacker was wearing MAGA hat, would be national news! This is the violent left! 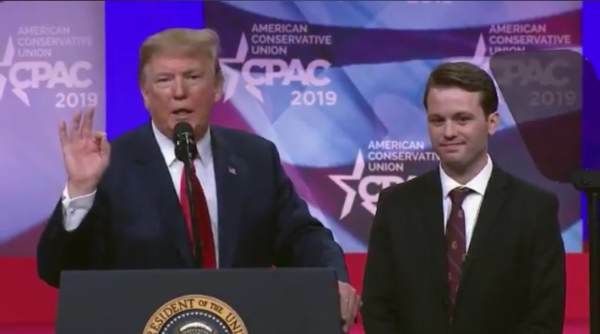 Hayden Williams, the conservative activist who was sucker-punched recently by UC Berkeley thug Zachary Greenberg joined President Trump on stage at CPAC on Saturday. “He took a hard punch in the face for all of us,” President Trump said. Hayden Williams received a warm welcome and a standing ovation Saturday at CPAC. President Trump announced he will sign an order tying fed funds for higher education to free speech protection….after bringing on stage Hayden Williams, Tom Fitton said. As previously reported, a violent leftist attacked a Turning Point USA activist who was out recruiting for their chapter at UC Berkeley last Thursday afternoon in Upper Sproul Plaza. The assault was captured on video and posted to Twitter by Turning Point USA founder Charlie Kirk.